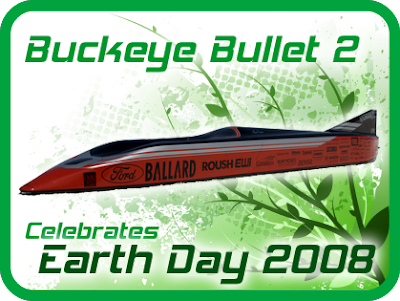 Buckeye Bullet Team Blog: Happy Earth Day! Sometimes we, the Buckeye Bullet team, may appear to be all about speed. After all, we are going after the top electric land speed record. But we're also about making advances in automobile technology, and in a more broad context, advances in energy. We work towards developing new technology, and bringing awareness to the issues that surround energy and the environment. So, while we work to advance alternative energy technology, we'd like all of our supporters to think about the impact we all make on our world, and how we can work to reduce our footprint and make the world a little better for everyone. Happy Earth Day!